When I am in my local Tesco I like to take a quick browse through the beer aisle to see if there are any bargains. I am a big fan of Bulmers cider, even having a ‘Bulmers’ custom license plate while I lived in California and custom ‘Bulmers’ t-shirts made. 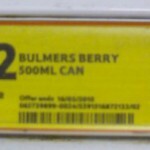 I have always felt that Bulmers is priced a bit high but the price per litre during this trip was crazy – –€92.50 per litre!! While the correct value is €4.44 per litre,how can such an error happen? Surely this stuff is all in a computer. I didn’t inform Tesco because it seems to be pointless – I have used their Tesco Feedback site but have never received a response to any of my feedback.